Designed to operate with Factair's Mobile Breathing-Air Compressors, Long Duration Cylinders Sets and Safe-Air Cabinets as well as standard equipment, a range of masks and hoses is available to provide the best possible protection for operatives working in hazardous environments. Factair supplies both PVC and rubber anti-static breathing-air hoses designed in accordance with the requirements of EN 14593 and EN14594. Both of these hose ranges fully meet the 1000 Newton class B standard, type tested to kink, pull and crush test criteria to ensure their pressure integrity and strength. As standard Factair's breathing-air hoses are fitted with CEJN type connections but other couplings can be fitted on application. 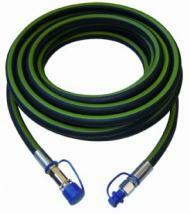 In addition Factair can also offer a range of hosereel options.